Have you ever thought about how you can engage thousands of followers, make yourself more marketable, and give your audience direct access to your content 24/7? If you have, then a mobile app would be perfect for you. It's a perfect place to consolidate all of your social media content in one place, and adds an increase sense of professionalism to your brand. And let's be honest, a DJ's brand can be crucial for business. I'm now at the point that I don't even carry business cards anymore. Most of the times the recipient will misplace or lose the card so I do something better. I tell them to download my app! It will have all of the contact information they'll need to reach me in the future. Not only is it a "virtual" business card, but your audience will have access to all of your mixes, pictures, upcoming events, etc. What's great about BV Mobile Apps is that they will cater your app specifically to what you need. You can have your mixes under one tab and have independent records you are servicing under another. My app is set up to where as soon as my mixes are uploaded, it immediately sends a notification to everyone who has the app. You even have control as to how often your audience will receive notifications. Owning your personal mobile app is much cheaper than you think. 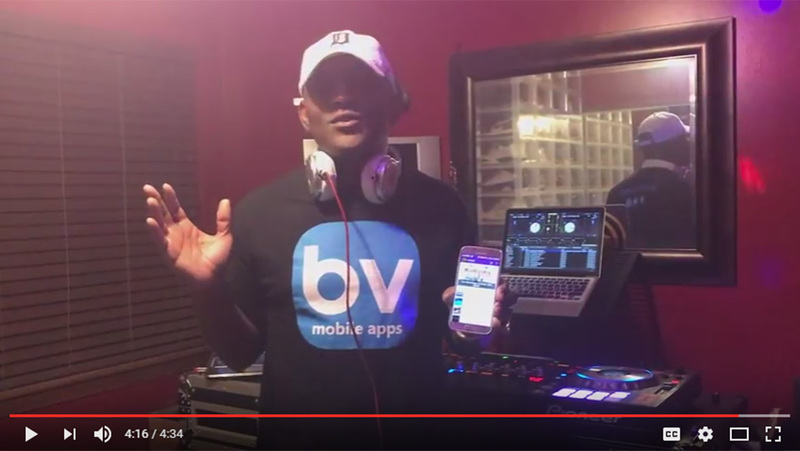 BV Mobile Apps have different plans that will fit your budget and a substantial discount if you pay for the year. They service all mobile platforms (iPhones, iPads, and even android). Their customer service is phenomenal and they always respond to questions or app changes quickly. If I were you, I would give them a call and get your app started today!